New research and delicious, easy-to-follow recipes were presented at the Blueberry Health Research and Culinary Luncheon on Wednesday, where dieticians, researchers, and chefs met in Bouley’s Test Kitchen in New York City to explore the world of blueberry cuisine. The intersection between cuisine and healthy lifestyle choices is often met with apprehension, as people try to navigate their way through nutrition, each time given the opportunity to nourish their bodies. Chef David Bouley’s test kitchen, located in the financial district of Manhattan, is inconspicuously tucked into a second story space with wide open windows overlooking the city’s sidewalk below. Natural light blankets the long white tables that wait to be decorated with intricate and thoughtful dishes, while on the other side of the rectangular room is furnished with ceiling high bookcases, alluring music, chandeliers, a grand piano, and equipped with a full kitchen and staff. The event was hosted by the U.S. Highbush Blueberry Council, which is devoted to studying the health benefits of blueberries through research. 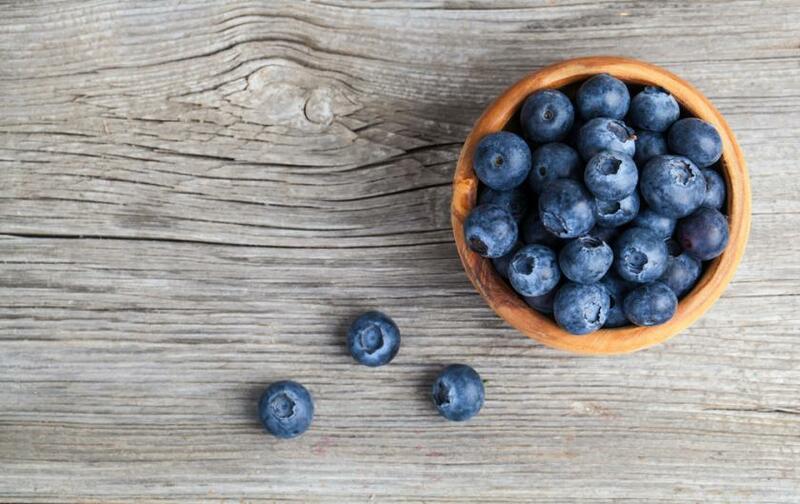 They’ve recently become an integral sponsor of a new study, which is in its early stages and focuses on blueberries' flavonoid components, conducted by Dr. Eric Rimm in collaboration with the University of East Anglia in the UK. “What berry is better than another berry?” asked guest speaker Rimm, who is a professor of epidemiology and nutrition at Harvard School of Public Health and served on the advisory committee for the 2010 USDA Guidelines for Americans. Guests were taught how to construct a blueberry-wheat berry salad by Rebecca Scritchfield, one of the event’s speakers, who is a registered dietician, health fitness specialist, and founder of Capitol Nutrition Group. Cooked wheat berries, celery, parsley, scallions, lemon juice, oil, and walnuts were decorated with plump blueberries. While Scritchfield encouraged healthy lifestyle choices, guests were served a five course meal, each dish incorporating blueberries from hors d’oeuvres to dessert. Blueberry-marinated tuna was delivered in slender white spoons preceded Chatham Bay Sea Scallops with a blueberry and Balinese pepper crust were followed by chilled blueberry soup with a blueberry sorbet. The meal was ended after guests finished their blueberry Clafoutis with an apricot coulis, and blueberry gelato. The blueberry inspired dishes, David Bouley explained, were carefully constructed with health in mind. “I honestly could not care less about how many calories I eat a day. I don’t know and you probably don’t either,” said Scritchfield, who encourages her dieters to eat as many healthy foods as they can without starving themselves. Scritchfield explained if there were a perfect diet then we would all be on it, but nutrition and health are individualized care and need to be treated as such. The goal, she tells her clients, is health with weight loss as a side effect. With a 95 percent failure rate for diets, lifestyle and behavior change are key. Even if a dieter does lose weight, they will regain two-thirds of what they lost within the year and within five years they’ll fully gain it all back and even sometimes gain more than they started out with in the first place. In order to avoid the exacerbating and frustrating yo-yoing, Scritchfield suggests implementing the following eight lifestyle strategies for everyday life. Decorate with color, half with produce and don’t eliminate foods you love, so long as they’re balanced, proportioned, and met with greens and fruits. Only 33 percent of Americans are eating enough fruit each day and that’s something that can change by throwing blueberries into salads, breakfasts, and desserts. “Healthify” your home by making sure good foods have the best access to you and your family. A bowl of fruit is placed on the counter instead of a bag of chips and changing your grocery list into a cleaner and more healthful one, are just a couple of easy changes. Master the “mini workout” which teaches women to work out without the stress and stringency. By creating small work outs whenever there’s a chance to, it eliminates the stress and negative ties people often wind up making with physical activity. Make movement your stress reducer and boost “feel good” endorphins, which are known to increase comfort, confidence, and course calming hormones throughout your body. Activate your life with physical projects, exercises, and events that fulfill you. The average person gets 17 minutes of exercise a day when we really need 60 minutes. Do something you truly love for one hour a week and consider it your own “happy hour” regardless if it included indulging in drinks or not. Read a book, go out to lunch with a friend, or pamper yourself with a massage or manicure. As long as you remember that a healthy lifestyle doesn’t mean it needs to be a regimented and stressful focus in your life, success will come. Make a “to don’t list” for yourself. Back out of commitments in a responsible way, if you feel that they won’t fulfill or reward you or else it will only create stress. Stress is the number one reason for poor sleep quality, which accounts for 48 percent of Americans. Slowdown and recharge by spending more time prepping meals at home and with the family. Entertain over meals and play interactive games with family and friends at home. According to Scritchfield, studies show that children who have sit-down meals with their family are less likely to engage in negative behaviors such as drugs and alcohol. The mind and body must be in unison, in order to create a healthier and happier lifestyle. It simply means to make sure that you shouldn’t deplete your mental and emotional health while you work to improve upon your physical health. Scritchfield often works with therapists to better her understanding of why people may overeat, overcompensate, under love or under nourish themselves.